Russian pancakes are a traditional weekend breakfast food in Russia and are also often eaten with tea as a snack or a dessert. They are probably unlike any other kind of pancakes you’ve had before. They differ from French crepes since they are slightly thicker, but about the same in diameter and they're different from American-style pancakes since they are much thinner and wider. 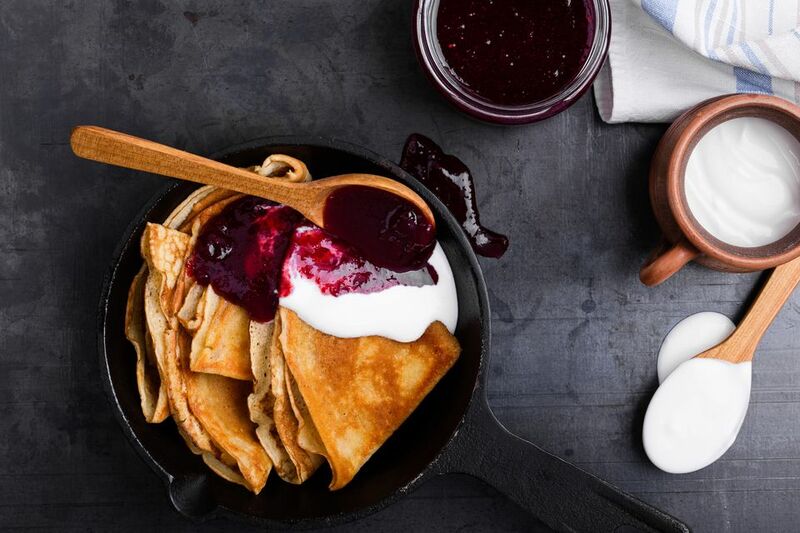 The typical toppings and fillings used for Russian pancakes are also quite different - you will never see pancakes with maple syrup at a Russian restaurant! You only need a few very simple ingredients to make Russian pancakes – milk, eggs, and flour form the basis of the recipe. The pancakes can be made with or without yeast, but this recipe omits the yeast for ultimate simplicity. They can also be made with buttermilk, but again, regular milk is the easiest to find and work with so that’s what this basic recipe uses. It’s a very simple recipe and quite difficult to mess up. There’s no reason you shouldn’t treat yourself to breakfast with these delicious pancakes. Add sugar (1 tbsp. for savory pancakes, 2 for sweet) and salt. Mix gently with a whisk until integrated. Add 200 mL (3/4 cup) milk and stir. Add flour and mix until batter is formed. Add remaining milk and stir until integrated. Add the oil and stir. Let the batter sit for 20 minutes. Heat up your skillet and add a bit of oil to it. Pour the batter into the pan (max. 1 ladle) and quickly tilt the skillet from side to side, forming an even circle. When the sides of the pancake start to look dry and a bit golden, flip the pancake over with a thin spatula. Wait for the same length of time, or slightly less, then flip the pancake onto a large plate and spread a pat of butter on top. You can either fold the pancake over or keep them all in a flat stack. To keep them warm, keep them in a slightly warmed oven. Russian pancakes are often eaten with various fillings and it's common to make a burrito-style wrap out of them. Sweet fillings include jam, jam mixed with cottage cheese, or honey with cottage cheese. Savory fillings are often things like potatoes mixed with chives and sour cream or various types of fish and potato fillings. Caviar is another popular, although fancier and more expensive, filling. Another common way is simply served with a dollop of sour cream and a side of jam. You can roll up the pancake and dip it into one, the other, or both. You can also top the pancakes directly with honey or melted chocolate. Russian pancakes are typically not served with syrup (of any flavor), cheese, ham, bacon or apples as is common in other cultures. Tea is a must-have to go along with Russian pancakes, although coffee is also an acceptable option.